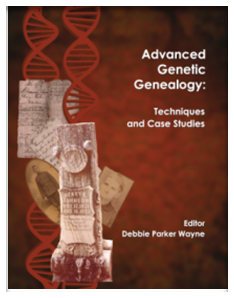 For ordering information and detailed descriptions on Advanced Genetic Genealogy: Techniques and Case Studies please see this page which includes links to book sellers, reviews, and a book descrpition. This is the first genetic genealogy book focusing on advanced analysis techniques using case studies to demontrate the principles. 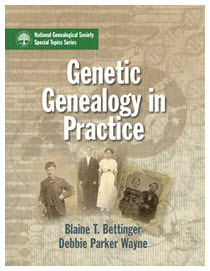 This book assumes the reader is already familiar with the basic concepts covered in Genetic Genealogy in Practice. For ordering information and detailed descriptions on Genetic Genealogy in Practice please see this page which includes links to a topic list, reviews, and awards. This is the first genetic genealogy workbook. This book covers the biological basics, types of DNA testing that are useful for genealogy, and analysis techniques needed for successful genetic genealogy. No matter which company a person tested at or which tools are used for data collection and analysis, the information in this book will help a researcher correlate DNA evidence into a family study. Members of NGS get access to articles by downloading the electronic copy of the magazine or by receiving the print version. Non-members may access print copies of the magazine at genealogy libraries or become a member to obtain access. Some older articles are linked below. "Using mitochondrial DNA for Genealogy." National Genealogical Society NGS Magazine 39 (October-December 2013): 26-30. "Using Y-DNA for Genealogy." National Genealogical Society NGS Magazine 40 (January-March 2014): 20-24. "Using Autosomal DNA for Genealogy." National Genealogical Society NGS Magazine 40 (April-June 2014), 50-54. "Using X-DNA for Genealogy." National Genealogical Society NGS Magazine 40 (July-September 2014): 57-61. "First Look at Shared Genealogy of DNA Matches." National Genealogical Society NGS Magazine 40 (October-December 2014): 58-61. "Logging and Analyzing atDNA Matches." National Genealogical Society NGS Magazine 41 (January-March 2015): 58-61. "Genetic Genealogy Standards." National Genealogical Society NGS Magazine 41 (April-June 2015): 59-61. "Why is my cousin not on my DNA match list?" National Genealogical Society NGS Magazine 41 (July-September 2015): 59-61. "Tips for Initial Contact with a Match." National Genealogical Society NGS Magazine 41 (October-December 2015): 39-41. "What We Don't Know." National Genealogical Society NGS Magazine 42 (January-March 2016): 41-42. "Just Fishing or Targeted Testing." National Genealogical Society NGS Magazine 42 (April-June 2016): 40-43. "Targeted Testing for Autosomal DNA." National Genealogical Society NGS Magazine 42 (July-September 2016): 38-41. "Triangulating Autosomal DNA." National Genealogical Society NGS Magazine 42 (October-December 2016): 39-42. "DNA Projects." National Genealogical Society NGS Magazine 43 (January-March 2017): 51-54. "Introduction to Autosomal DNA Tools." National Genealogical Society NGS Magazine 43 (April-June 2017): 57-61. Genetic Genealogy Testing. New Mexico Genealogist. Theme Issue on Genetic Genealogy. Vol. 55 (September 2016). Every article in this issue is on the topic of DNA and using DNA to answer genealogical questions. Information on what a person can learn from Y-DNA, mitochondrial DNA, and autosomal DNA tests for genealogical purposes. Includes recommendations for steps to take to get the most from the test results by using public tools available no matter where the DNA test is performed. Published in Stirpes, Texas State Genealogical Society, September 2011. Basic information on the DNA tests useful to genealogists and how that information can be used to support conclusions about ancestors. Published in Stirpes, Texas State Genealogical Society, June 2009. "DNA Quick Reference Notes." Deb's Delvings Blog, posted 13 February 2015 (http://debsdelvings.blogspot.com/2015/02/dna-quick-reference-notes.html : 2015). Now re-routed to http://debbiewayne.com/pubs.php#quickref. "X-DNA Inheritance Charts." Deb's Delvings Blog, posted 25 October 2013 (http://debsdelvings.blogspot.com/2013/10/x-dna-inheritance-charts.html : 2014). "Percentage Shared atDNA Chart." Deb's Delvings Blog, posted 29 October 2013 (http://debsdelvings.blogspot.com/2013/10/percentage-shared-atdna-chart.html : 2014). "atDNA: I Don't Match My Cousin's Cousin." Deb's Delvings Blog, posted 22 September 2013 (http://debsdelvings.blogspot.com/2013/09/atdna-i-dont-match-my-cousins-cousin.html : 2014). "Disappointed in DNA test results?" Deb's Delvings Blog, posted 16 September 2013 (http://debsdelvings.blogspot.com/2013/09/disappointed-in-dna-test-results.html : 2014). "DNA: Patents, Permissions, Property, Ethics." Deb's Delvings Blog, posted 7 October 2013 (http://debsdelvings.blogspot.com/2013/10/dna-patents-permissions-property-ethics.html : 2014). "Free Genes vs. Patented Genes." Deb's Delvings Blog, posted 7 September 2013 (http://debsdelvings.blogspot.com/2013/09/free-genes-vs-patented-genes.html : 2014). "My Mitochondrial Mothers," Deb's Delvings Blog, posted 21 October 2013 (http://debsdelvings.blogspot.com/2013/10/my-mitochondrial-mothers.html : 2014). "Why So Much Excitement about Ethnicity Predictions?" Deb's Delvings Blog, posted 18 September 2013 (http://debsdelvings.blogspot.com/2013/09/why-so-much-excitement-about-ethnicity.html : 2014). A case study demonstrating use of multiple indirect sources to prove that multiple names and initials used in multiple locations all refer to one man. Published in Stirpes, Texas State Genealogical Society, March 2011. Third-place winner, 2012 Excellence in Writing Competition, Category 2 (Published Article), International Society of Family History Writers and Editors (ISFHWE, http://www.isfhwe.org/). This essay tells part of the life story of Henry Parker (1823/1825 to 1902) and Nancy (Black) Parker (circa 1835 to 1902). The story is based on research done as part of a multi-generational study of this Parker family. Many facts on this family and the collateral relatives could not be included due to word count limitations. Future publications are planned to allow a more complete story of this family to be told. Endnotes instead of footnotes were requested by the contest committee. Second-place winner, Dallas (Texas) Genealogical Society Writing Competition 2012 (DGS, http://www.dallasgenealogy.org/). A case study demonstrating why we need to follow the Genealogical Proof Standard even when we have direct evidence for a relationship. The example demonstrates how to analyze and correlate information from multiple sources. Published in OnBoard, Newsletter of the Board for Certification of Genealogists, January 2011. A case study in using online tools to find more information about Texas land records. After locating an entry in an online index information is found to allow a copy of the original file to be obtained as well as access to copies of documents digitized and freely available on the Texas General Land Office Web site. Published in Digital Genealogist, July/August 2009. A report of the results of a collaborative project testing how close several genealogical programs can come to reproducing the output of two articles previously published in the National Genealogical Society Quarterly. Published in Digital Genealogist, September/October 2008. These Quick Reference DNA documents and links are handy references for DNA analysis. Many of these charts have a Creative Commons license so others can improve them as long as copies are freely provided to others under the same licensing scheme. See "About The Licenses" at the Creative Commons site for more information. The linked papers and websites may have copyright restrictions. Elizabeth Shown Mills, Evidence Explained: Historical Analysis, Citation & Source Usage (https://www.evidenceexplained.com/); in particular see "QuickLesson 21: Citing DNA Evidence: Five Ground Rules" (https://www.evidenceexplained.com/content/quicklesson-21-citing-dna-evidence-five-ground-rules). Doron Behar et al., "A 'Copernican' Reassessment of the Human Mitochondrial DNA Tree from its Root," The American Journal of Human Genetics 90 (April 2012): 675-84; archived at National Center for BioTechnology Information, PubMed Central (http://www.ncbi.nlm.nih.gov/pmc/articles/PMC3322232/); DOI: 10.1016/j.ajhg.2012.03.002. Mark Stoneking, "Hypervariable Sites in the mtDNA Control Region are Mutational Hotspots," The American Journal of Human Genetics 67, no. 4 (October 2000): 1029-32; accessed online (http://www.cell.com/ajhg/fulltext/S000292970763300X); DOI: http://dx.doi.org/10.1086/303092. Ann Turner, "Now You See It, Now You Don't: Heteroplasmy in Mitochondrial DNA," Satiable Curiosity, Journal of Genetic Genealogy 2 (2006): iv-v (http://www.jogg.info/21/SatiableCuriosity.pdf). M. H. D. Larmuseau et al., "Low Historical Rates of Cuckoldry in a Western European Human Population Traced by Y-chromosome and Genealogical Data," Proceedings of the Royal Society B: Biological Sciences 280, no. 1772, December 2013; accessed online (http://rspb.royalsocietypublishing.org/content/280/1772/20132400); DOI: 10.1098/rspb.2013.2400. "Collecting Sharing Information for Known Relationships"
"Collecting Sharing Information for Known Relationships – Part II"
"Visualizing Data From the Shared cM Project"
"The Shared cM Project – Longest Shared Segment"
"Visualizing Distributions for the Shared cM Project"
The portal to submit data for the project is HERE. Reshmi Chowdhury et al., "Genetic Analysis of Variation in Human Meiotic Recombination," PLOS Genetics, 18 September 2009; accessed online (http://journals.plos.org/plosgenetics/article?id=10.1371/journal.pgen.1000648); DOI: 10.1371/journal.pgen.1000648. Graham Coop, "How Many Genetic Ancestors Do I Have?," The Coop Lab, Population and Evolutionary Genetics, UC Davis, gcbias, 11 November 2013 (https://gcbias.org/2013/11/11/how-does-your-number-of-genetic-ancestors-grow-back-over-time/). Steve Mount, "Genetic Genealogy and the Single Segment," On Genetics, 19 February 2011 (http://ongenetics.blogspot.com/2011/02/genetic-genealogy-and-single-segment.html). Blaine T. Bettinger, "More X-Chromosome Charts," 12 January 2009, The Genetic Genealogist (http://www.thegeneticgenealogist.com/2009/01/12/more-x-chromosome-charts/). Sue Griffith, "DOWNLOADS," various dates, Genealogy Junkie (http://www.genealogyjunkie.net/downloads.html). Scroll down to templates for X-DNA. John Motzi, "X Inheritance Ancestry Charts" with only ancestors in the X inheritance lines (http://debbiewayne.com/presentations/dna/MotziJohn_Xinheritance_Ancestry_Chart.xlsx). Contact John.Motzi@att.net with questions and comments. He developed a different X-Ancestry Inheritance chart. Unlike most X-Ancestry charts currently available, this chart depicts only those ancestors which comprise the potential line of X inheritance. All other (male) lines shown in the conventional ancestor tree are not included.